There are lots of upsides to Easter, and one of our favorites is the array of sugary pastel desserts you can make without spending an entire afternoon in the kitchen. 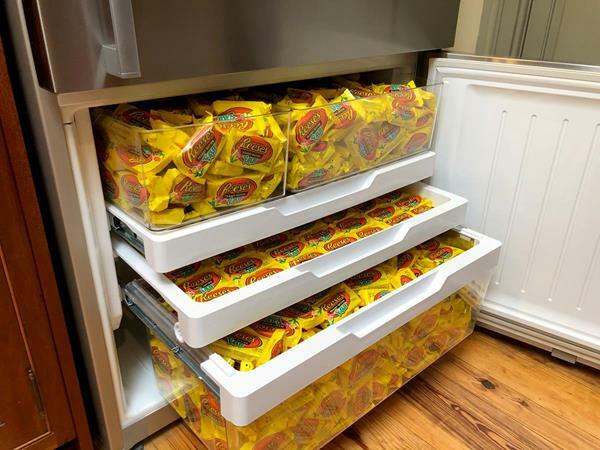 Whether you're trying to use up extra candy, impress your guests, or just have a little fun with the kids in the kitchen, these treats are both festive and impressive without being exhausting. If you've got frosting skills, whip up an Easter cake that'll knock everyone out of the park. 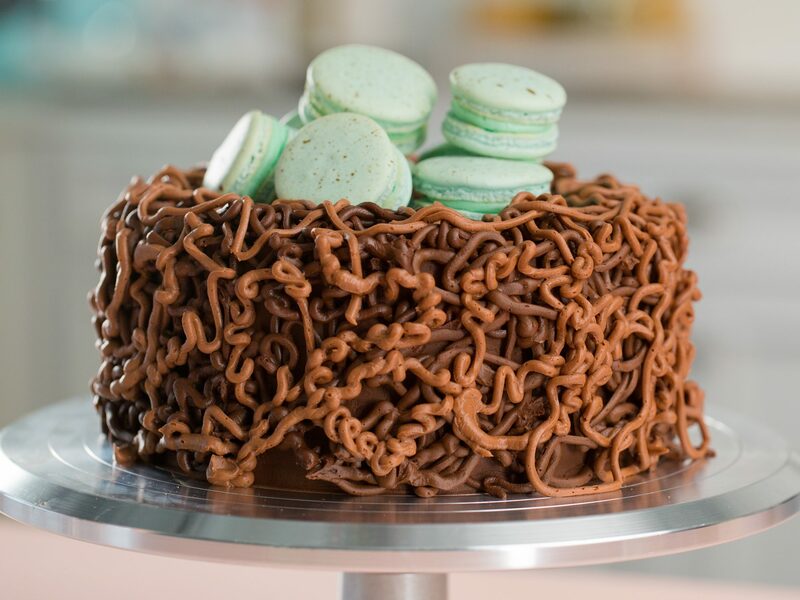 The secret's all in the technique: Instead of preparing a complicated cake, you're simply building things up with a frosting-based basket weave. To make this cake, you'll need two round cake layers with an 8-inch diameter, so use a reliable box mix or your favorite spring cake recipe. Peeps, Nutella, and a refrigerated pizza crust come together for a jaw-dropping pastel masterpiece. Notes: You can make these cookies up to 1 week ahead; cover airtight and store at room temperature. In humid or rainy weather, they may soften. Decorate store-bought cupakes for Easter by making cute bunny faces with marshmallows, coconut, pretzels, and an assortment of candy. Inspired by an Easter basket favorite, these malted chocolate cupcakes are sure to be the cutest dessert you serve this spring. The moist cake is a fun play on a chocolate malted egg; you can typically find malt powder either on your grocery store’s baking aisle or shelved near the canned milks. Once you top these rich cupcakes with a buttery, bright blue frosting, creating the signature Robin’s egg speckling is easy—and a fun project to let older kiddos help with. You simple thin out your brown food coloring with a little bit of water, dip a paint brush in, and then “flick” the brush’s bristles to splatter the dye on the surface of your frosted cupcakes. These festive cookies are loosely based on the Greek Easter specialty koulourakia. Use egg-shaped cookie cutters to create these Easter "eggs" (we ordered ours from H.O. Foose Tinsmithing Co.). Tint the frosting any color you like (or use several colors). Spread it onto the cookies, or spoon the frosting into a zip-top plastic bag, snip a small hole in one corner of the bag, and pipe the frosting in designs of your choice. The kids can help with the fun. These shortcut sweet rolls are the perfect special treat for a weekend brunch, but the truly beautiful thing about them is that they’re actually simple/speedy enough to whip up on a weekday morning—all thanks to a handy secret ingredient: canned crescent dough. That said, there’s no need to tell your guests just how easy these delightfully buttery-tender sweet rolls are to make, because once they’re all dressed up, no one would ever guess you didn’t make them completely from scratch. By skipping on making your own yeasted cinnamon bun dough, you allow yourself time to make a phenomenal filling. Each roll is filled with a rich strawberry cheesecake mixture, featuring fresh strawberries, store-bought strawberry cream cheese amped up with a little powdered sugar and vanilla, and graham cracker crumbs (a pro baker’s trick for adding depth and a fantastic texture). All that’s left to do is drizzle on a simple 2-ingredient glaze, and you have a wow-worthy skillet of fresh sweet rolls, ready to rock. It’s not Easter without a themed cake! Rather than deal with a fussy animal-shaped pan, bake two round cake layers with an 8-inch diameter and let a little food styling and frosting do the work. You can use a box cake mix make a favorite recipe from scratch, depending on the level of effort you want to put in. This method can also be used for the Carrot Easter Cake and Easter Egg Cake. Serve these adorable cakes at a special holiday brunch and watch everyone's surprise when they discover the lemon curd "yolk" in the center. Making them is simple enough that family or friends can help. You'll need a 2 1/4- by 2 3/4-in. egg-shaped cookie cutter*; if you don't have one, make an oval out of cardboard and cut around it. You'll also need a small paintbrush and cotton swabs. If you start with the cakes still slightly frozen, they'll be easier to cut. Make a batch of bunny-shaped cookies and use them to decorate the tops of store-bought cupcakes for a festive Easter dessert. Dip Peeps in melted chocolate and decorate with sprinkles for a super-easy and fun treat to make with your kids this Easter. 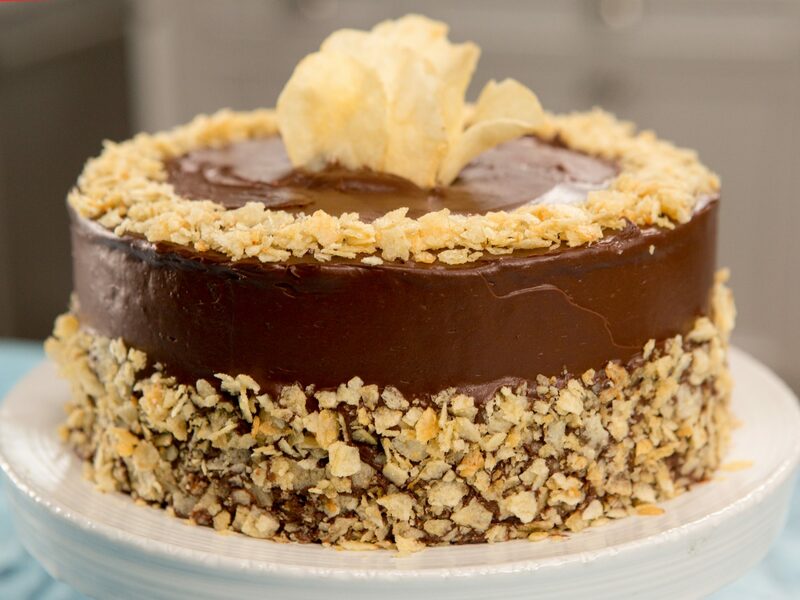 Looking for a way to add more pizzazz to an ordinary dessert recipe? Try brightening basic cupcakes with jelly beans. Proven be a huge hit with the little ones in the house. 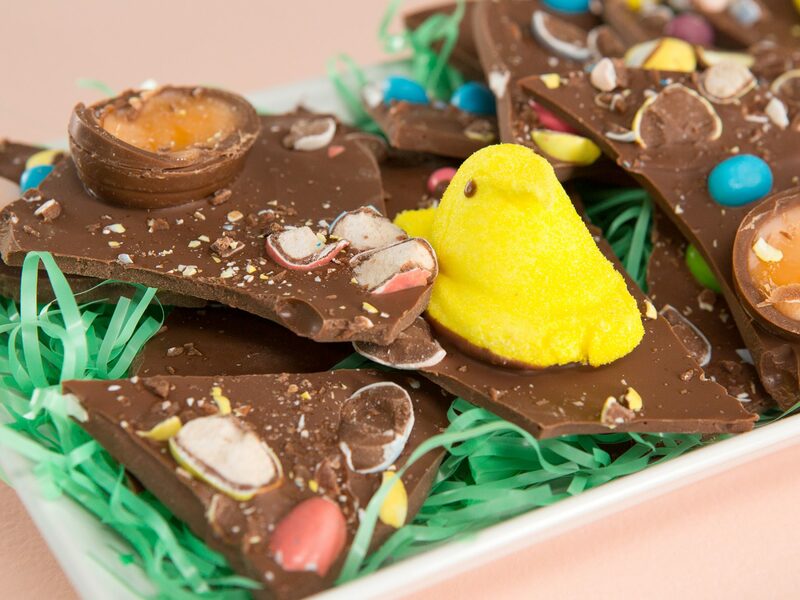 Fill your basket with homemade Easter treats! This recipe is a fun way to get kids involved with cooking, plus they’ll love making the rainbow swirls. Too cute to eat? Almost! 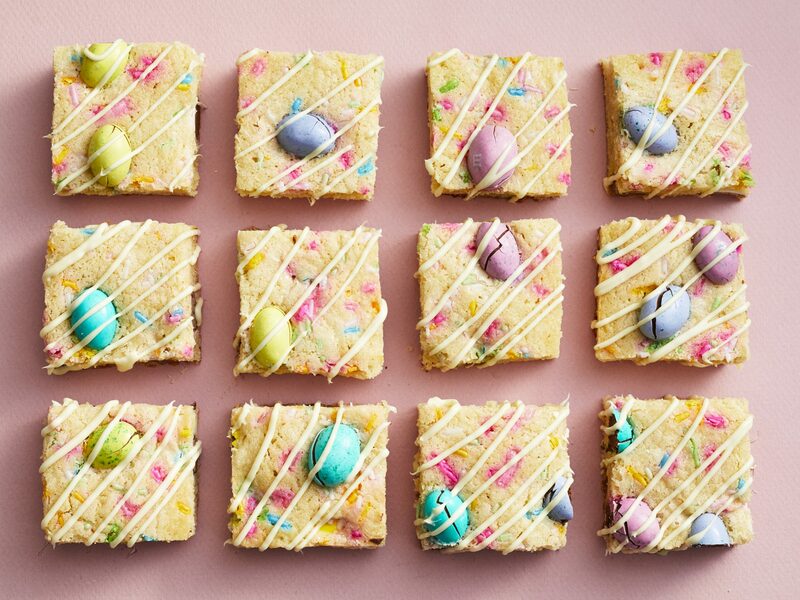 This five-ingredient Easter cookie dough can be made up to three days ahead, making it the perfect addition to your Easter recipe collection. It’s not Easter without a themed cake! Rather than deal with a fussy animal-shaped pan, bake two round cake layers with an 8-inch diameter and let a little food styling and frosting do the work. You can use a box cake mix make a favorite recipe from scratch, depending on the level of effort you want to put in. 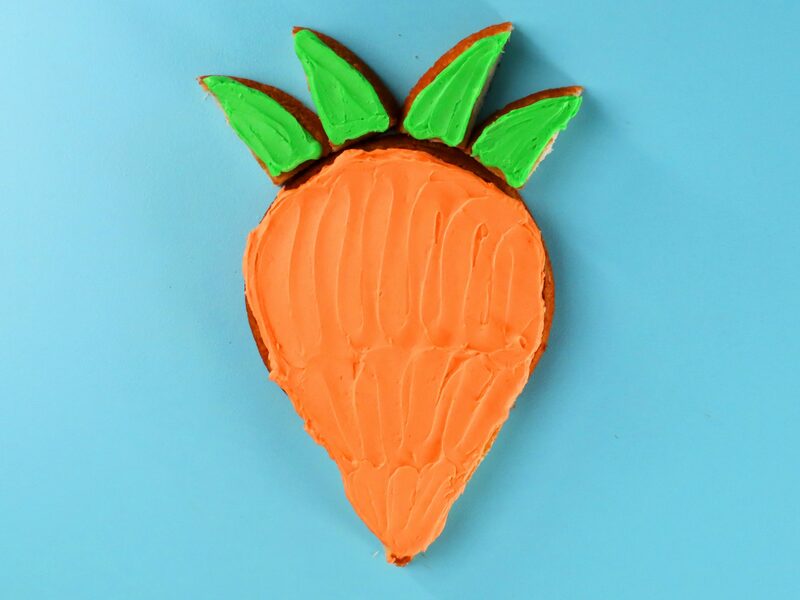 This method can also be used for the Carrot Easter Cake and Easter Bunny Cake. 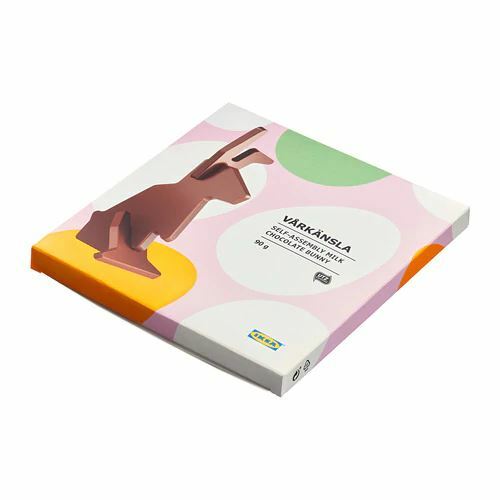 Bunny Cars will bring smiles to your Easter guests—young and old. These edible treats serve as decoration and dessert.